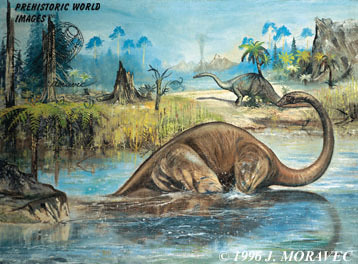 A Diplodocus art print conveys images of a time, millions of years past, where large dinosaurs roamed the earth. It transports the observer back in time, bringing him face to face with this gigantic sauropod. Take a closer look and it's possible to follow the curving back, long neck and tiny head of this magnificent creature. The Diplodocus was one of the largest land animals ever to stomp across the landscape in our distant past. It would have been an amazing sight to see, as its long neck carried its small head up into the heights of the rain forest canopy to snack on huge green leafs, for this large creature was a herbivore. 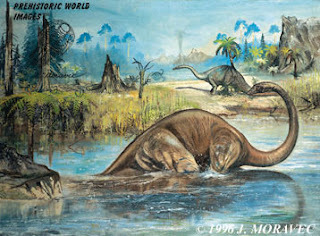 Owning and framing a Diplodocus art print leads to unavoidable images of the time they lived. The art print brings to life the dangerous landscape of prehistoric predators stalking the forests and plains. The Diplodocus was a central part of that landscape, always on the move for new trees to strip and munch on. They most likely traveled in herds, wary of the many predators looking for weakness in their group. However, their life was mostly sedentary, moving on four huge legs, a bit like a herd of elephants, from forest to forest. The enduring wonder of a high quality art print, and the subject image of the fascinating diplodocus, is a perfect combination for stirring the imagination. One of the coolest things about an art print is how desirable it is as an art medium. A poster of art may look good from a distance, but it's simply not to the same standard as a print, with its high-quality inks. A poster of art has a respectable place in the home, displaying fine artworks, but art prints hold a place of pride in a home. They're put on display, and the diplodocus art print will hold such a place in the heart of the owner. It's bound to occupy a prime piece of wall space in a room where people can appreciate the work and its subject matter. The artist who created the original oil painting from which this print was made is Josef Moravec, a renowned paleo-artist, whose works have been displayed in Natural History Museums throughout North America and Europe. His love for and knowledge of the subject of prehistoric life is evident in his work. The Diplodocus has been extinct for many millions of years, but come see him captured frozen in a moment of his life in an art print. Get up close and imagine the rising steam from long dead forests. There really was a time when this huge dinosaur trod on the ancient plains of our world.